It is the clanking of goat bells that I miss the most, the sound that greeted me in the late afternoon when I wandered outside for a walk after the bubble of heat had deflated. 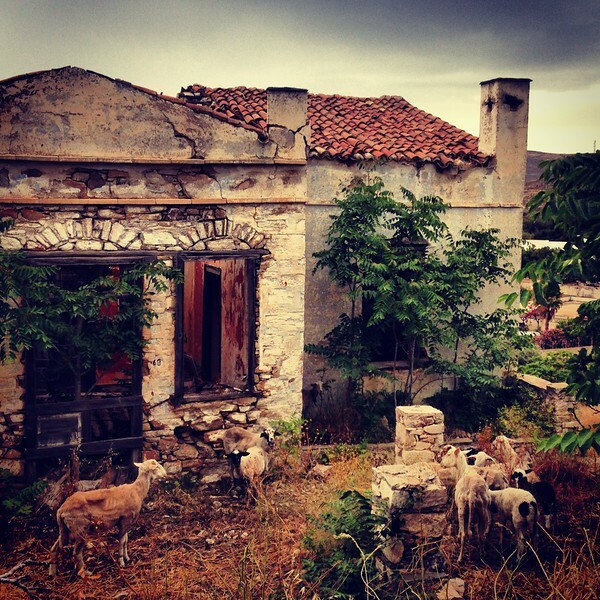 On Syros the goats were everywhere, hugging the sides of matted knolls, melting into the remnants of abandoned houses, their earth tones blending into the landscape and the crumbling brick. Bells swaying slowly as they moved from place to place, they provided a background hum, melancholy and consistent. Visually it would have been easy to forget they were there, but the clanging echoing between tufts of grass made the goats impossible to ignore. On my daily walk down to town, I would clomp down the steep driveway of the house and shade my eyes against the golden hour sun, stopping to watch the goats as they grazed. Unused to being a tourist attraction they would whip their heads up in alarm, begrudgingly carrying on with their meal when it became apparent that I was not going to get any closer. From the goats to the town it was almost a half-hour walk, one that had its own comforting loops of sounds and smells. First, the roosting hens, almost hysterical in their egg-laying frenzy, low clucks punctuated by high-pitched squawks. Then, the barking dog at the hardware store who eventually peed on my leg when he decided I was a friendly face and not an intruder. And just following the store, a sharp turn behind the primary school, where the wizard cat would sit aloofly, watching me go by. 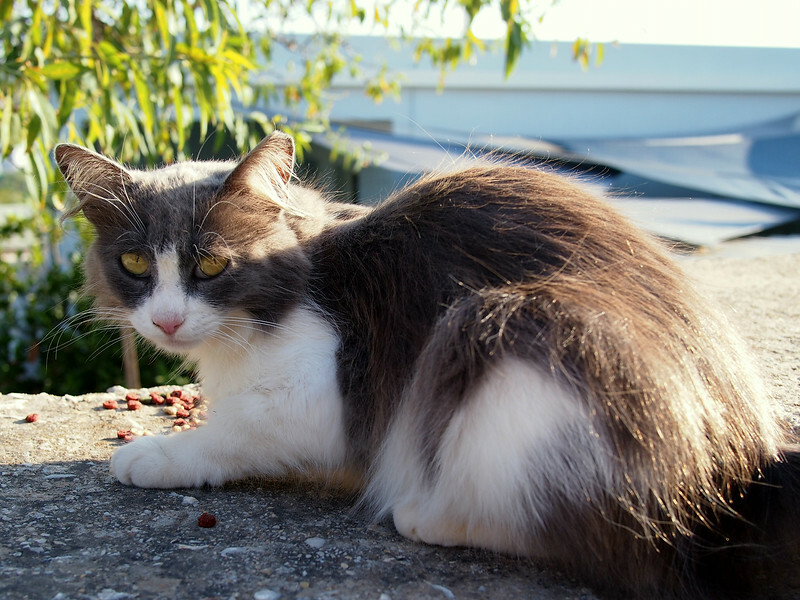 As I passed, he would inhale his breath sharply, hissing a half-warning as my feet crunched on the gravel and faded away. Wizard cat and his fluffy ears. Next, an abrupt dip as the brown hills and stone fences unfolded in front of me, sheep to the left, goats to the right. Toward the sea, then, climbing through branches and weeds, scratching my exposed ankles on a route that Google Maps claimed was a road but in reality was nothing more than a rough pathway along an abandoned home. Nearing the end of the path, I would tense up and wait for the large German Shepard who would growl at me like clockwork through his cage, angrily pushing his face to the bars as I crept by. “It’s just me,” I would whisper quietly, half to calm myself. At last, the “shortcut” opened up to the sea, cars and motorbikes zooming by, the sounds of children laughing and playing in the water and the waves reaching the shore. From there, the road curled around the water’s edge, following the rise and fall of the coastline until it dipped into the town of Finikas itself. As each day went by, spring bloomed into summer and the flowers opened. The grass changed colour and the honeybees buzzed more frantically, but the wizard cat was always waiting for me as I walked by. With each trip toward the sea, I would register differences in the view or tenor of sounds, losing myself in my routine. All of this to get a few groceries in Finikas. And then, of course, the walk back. Golden hills on the walk to Finikas. Continuing the walk to Finikas. 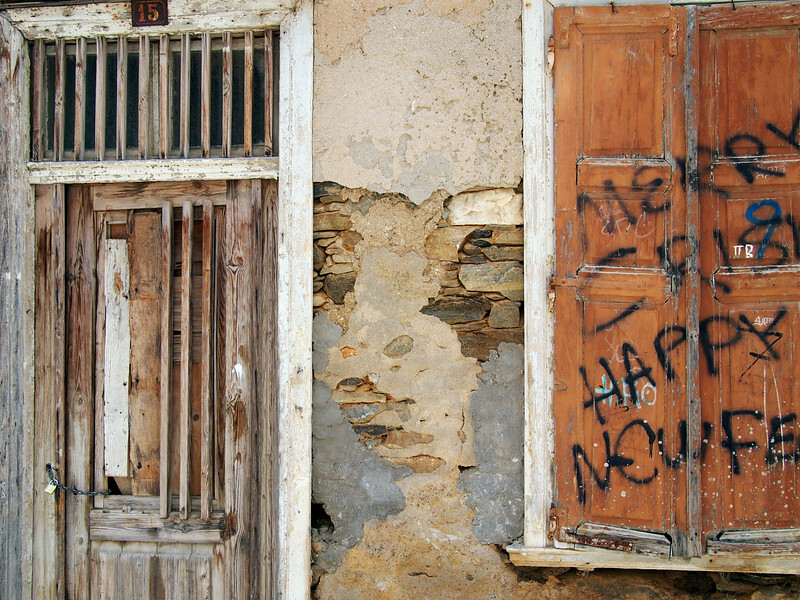 Three weeks into my time on Syros, navigating my way down the path toward Finikas once again, the man who owned the only bar in town stared at me with a mixture of curiosity and amusement as I walked by. I had just come past the barking dog, past the roosting hens, and past the agave plants that stretched up toward the sky. On the return, still sitting outside his bar, he beckoned me over. My backpack was full and almost bursting, stuffed with cheese and tomatoes and treats to lug up the hill to the house. Pulling his glasses down toward the end of his nose, he leaned in conspiratorially. “Why?” he asked, gesturing at me in one fell swoop, arms hitting his lap as they fell. I explained that my friend was offered a house for the month, and had invited me and a few others to base ourselves here for June. That we were all working for most of our time on Syros, tethering to our phones for Internet access to make for long days of typing and writing broken up with dips in the sea and walks for food. He smiled, leaning back in his chair. 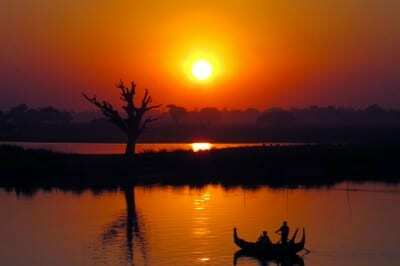 He pointed down toward the small marina, boats docking and people unloading to stock up at the supermarket. 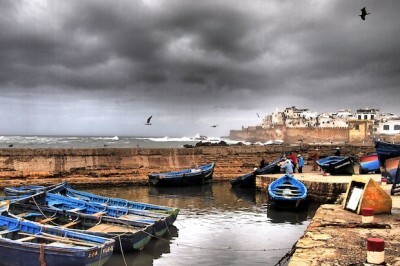 When we had arrived, the town was devoid of people, air still chilly at night and barely warming us up during the day. In the second week of June the weather changed considerably, hot sun and blue skies taking over and pushing our walk times until later in the day. Tourists began to trickle in mid-month, usually by boat, their blond hair and long limbs suspect to the older Greeks sitting on porches and staring at them impassively. Having arrived before that season began, we seemed to be exempt from this judgement, receiving instead a singsong “yassas!” as we walked by, or a gruff nod, eyes watching us as we turned to walk up the hill and back to our house once again. 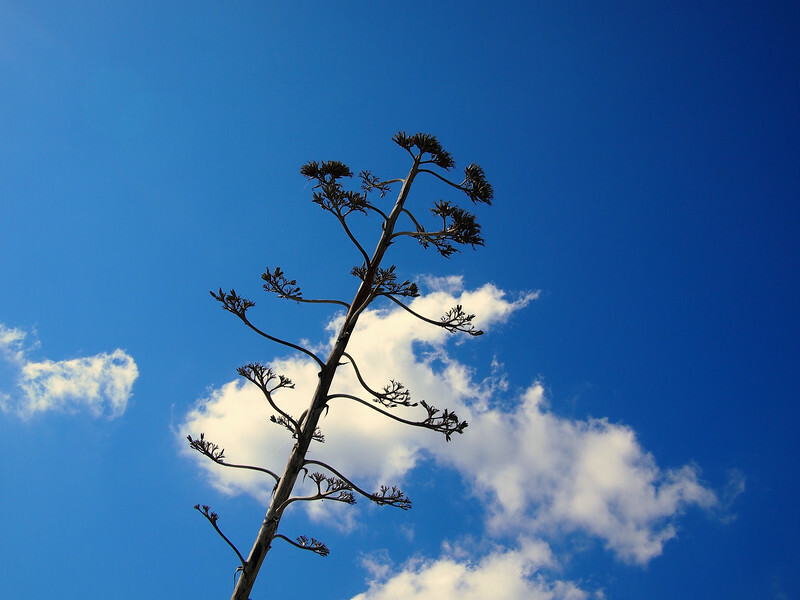 Agave plant on the walk to Finikas. 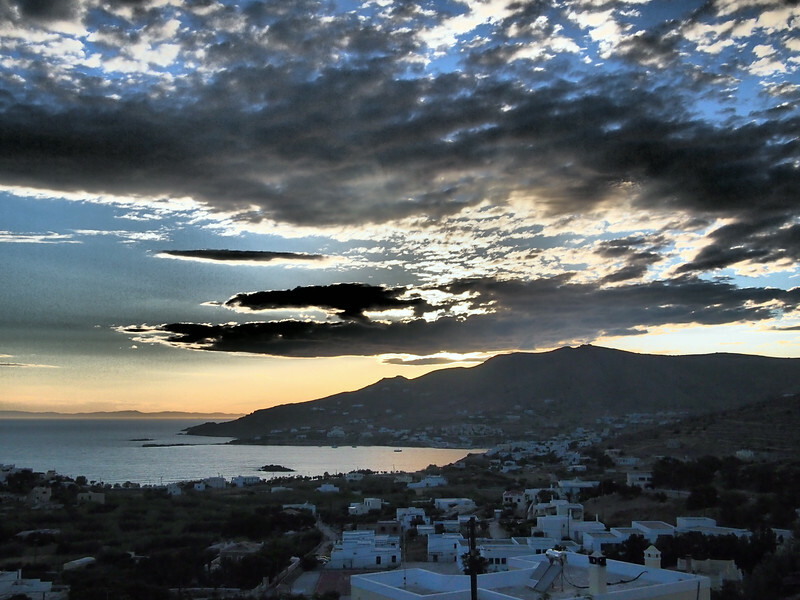 Unlike Mykonos or Ios or other well-known islands of the Cyclades, Syros is notorious for its family beaches and quiet nights. While friends who saw my Instagram feed from Greece kept asking “why aren’t you in Santorini? !”, I loved being in what felt like a non-touristy Greece, where locals were baffled by my presence there and I was able to watch the island wake itself from a winter hibernation. 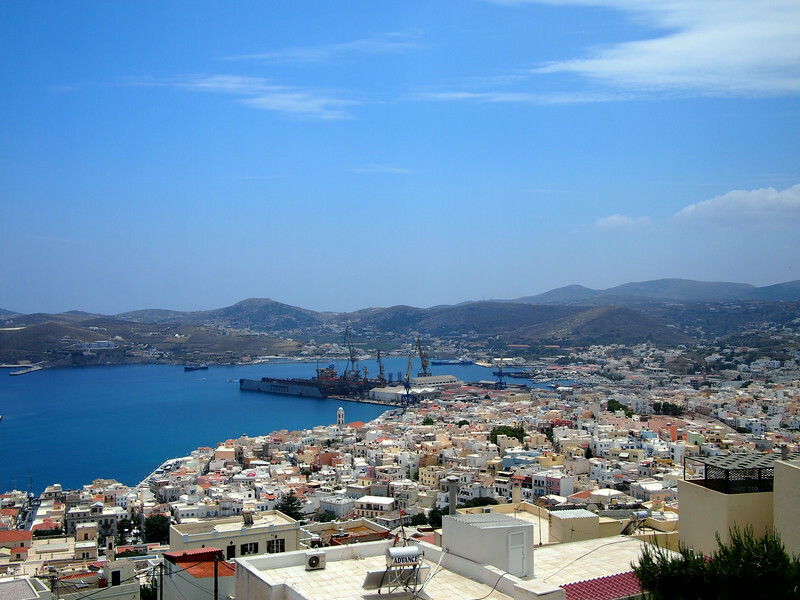 In the 19th century, Syros’ capital of Ermoupoli was a huge port town and shipping hub, crucial to trade within the region. 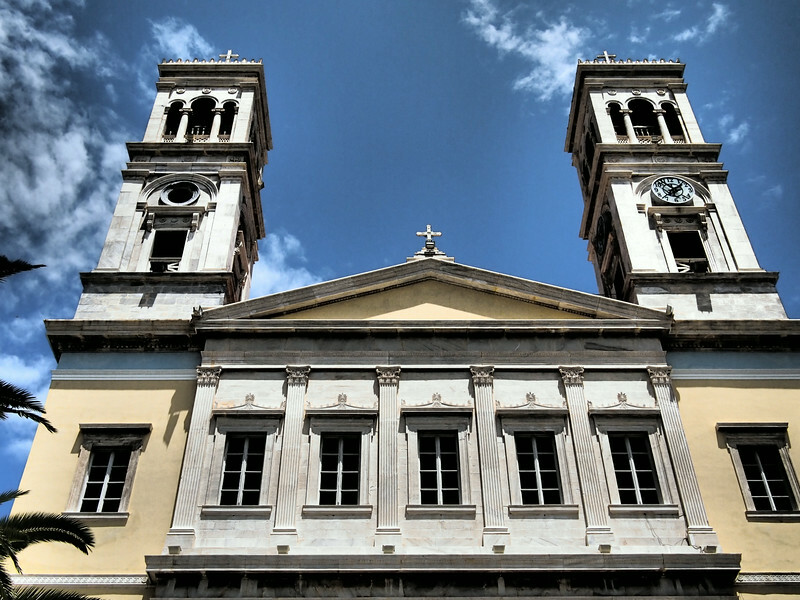 It was founded in 1821 in the wake of continuing war between Turkey and Greece and the fight for Greek independence, with sailors and merchants from Chios, Psara and Asia Minor taking refuge on Syros. Named after the ancient god of commerce (Hermes, with Polis meaning city), Ermoupoli quickly developed into an important stop on the trade route between Western Europe, the Middle East, and the Mediterranean. 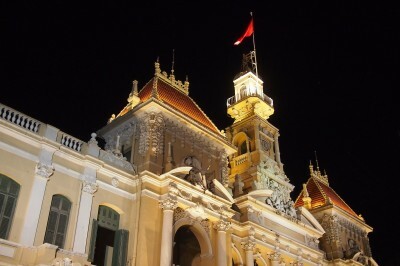 The city continued to rise as during the middle 1800s, with hospitals, schools, printing presses and shipbuilding operations, and a fashionable upper middle class. 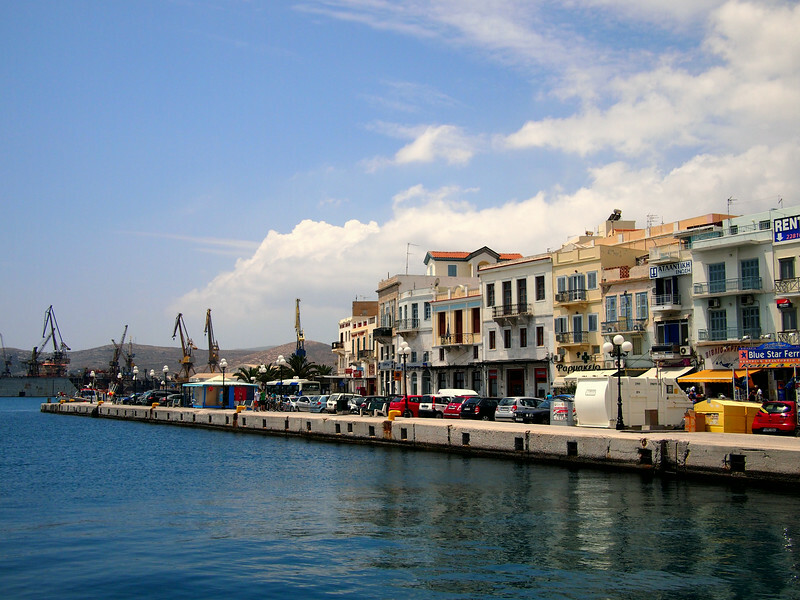 Ermoupoli’s economic success continued into the late 1800s, but the creation of the Corinth Canal connecting the Gulf of Corinth and the Saronic Gulf, as well as Greece funnelling investment into the Port of Piraeus, led to its decline. 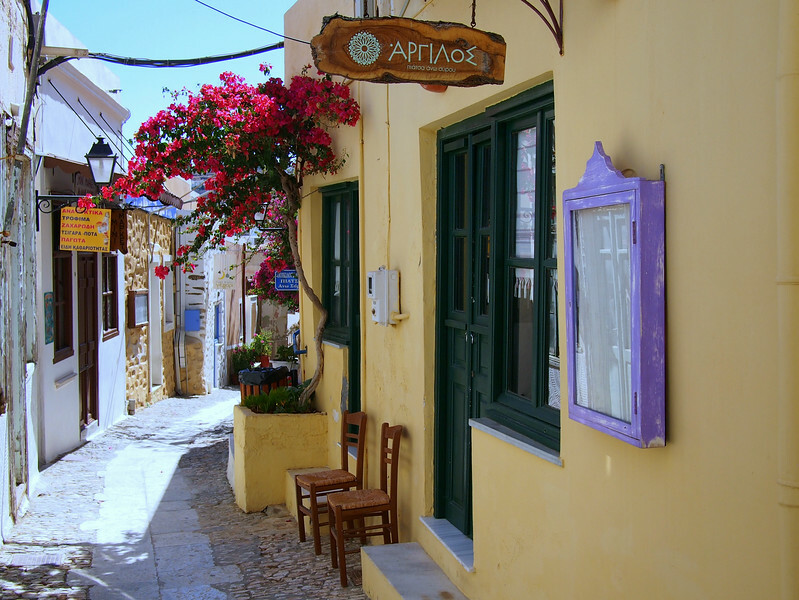 While the city remains the capital of the Cyclades and has beautiful neoclassical buildings and marble-filled squares, you can feel its regression as well as the impact of the current economic troubles plaguing Greece. 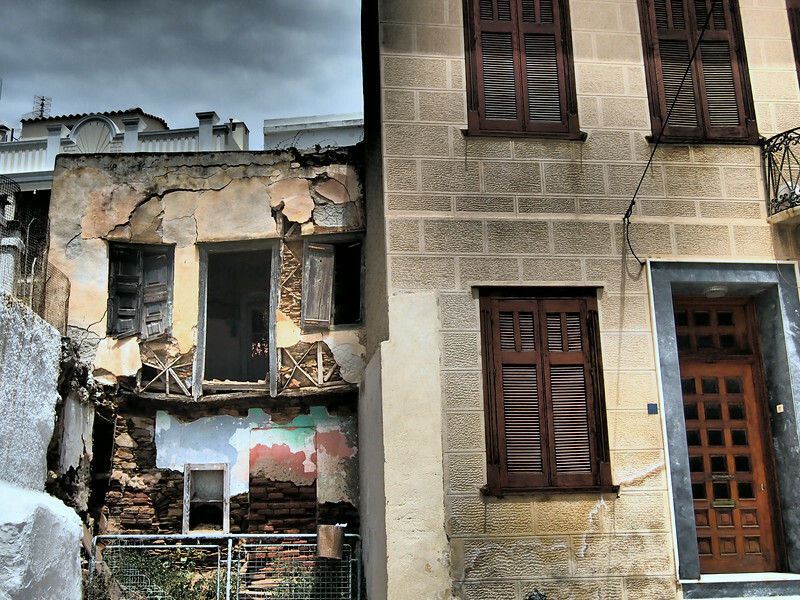 Moving upwards and away from the restored buildings near the water, many houses have been left to disrepair, the stairs leading up Ermoupoli’s steep hills alternating between paved and crumbling. That said, it is a capital and still a busy one at that. 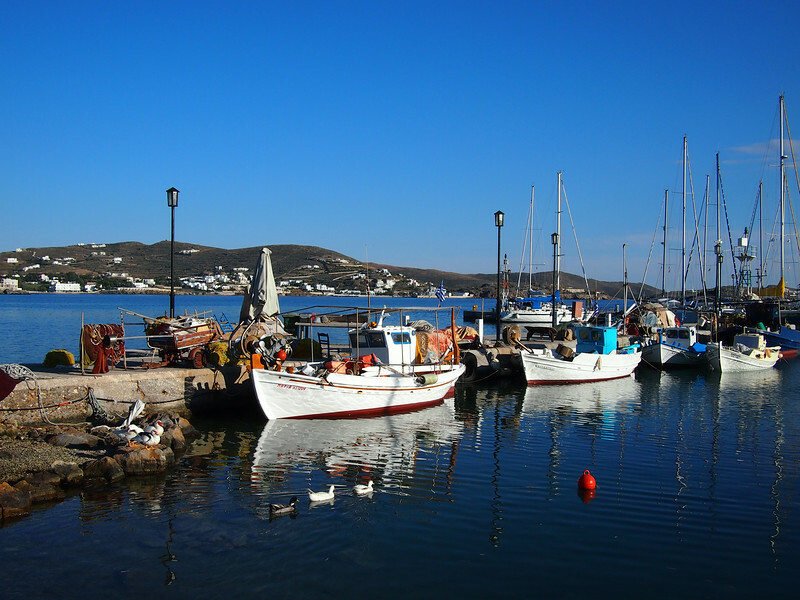 Since Syros is on the same ferry line as Mykonos, turnover is high and visitors can easily stop for a few nights on their way to another island. 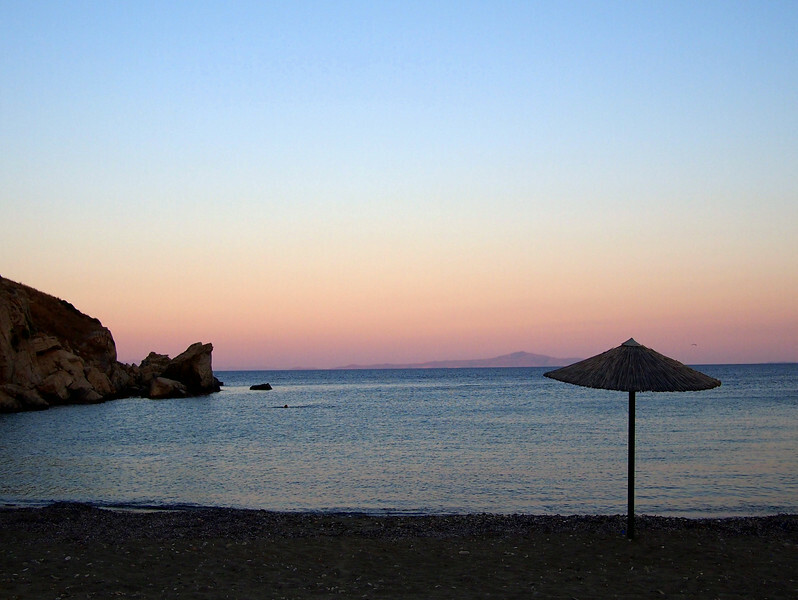 Locals were optimistic about further development in Ermoupoli, and its future role as a Cycladic hub. The restaurants near the water were busy, the Carrefour supermarket easily accessible, and it was a fascinating walk up and down the hills and alleys of the old city, climbing our way above the port and then down to the houses between churches and water. Edge of the waterfront in Ermoupoli before the ferry docks just around the corner. Ermoupoli as seen from the old town looking down to the harbour. 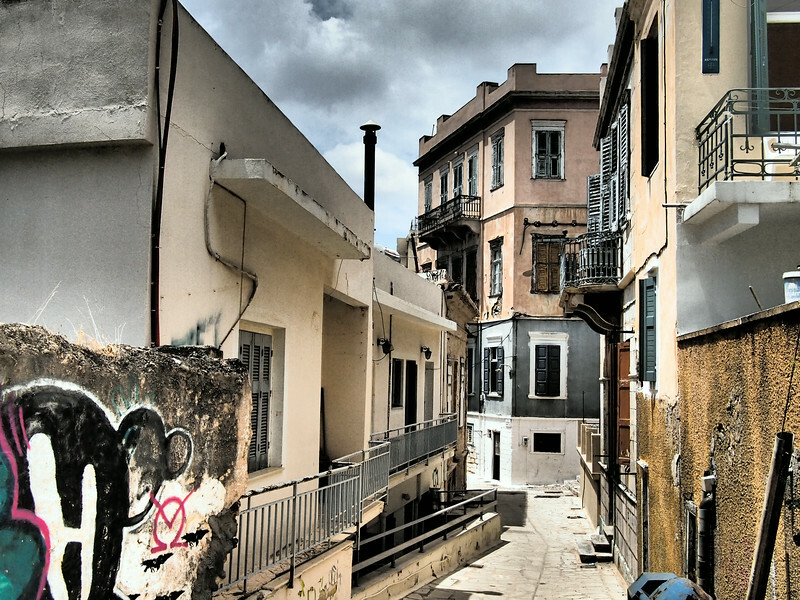 Walking up toward Anastasi church in Ermoupoli, a mixture of abandoned buildings, graffiti and inhabited homes. 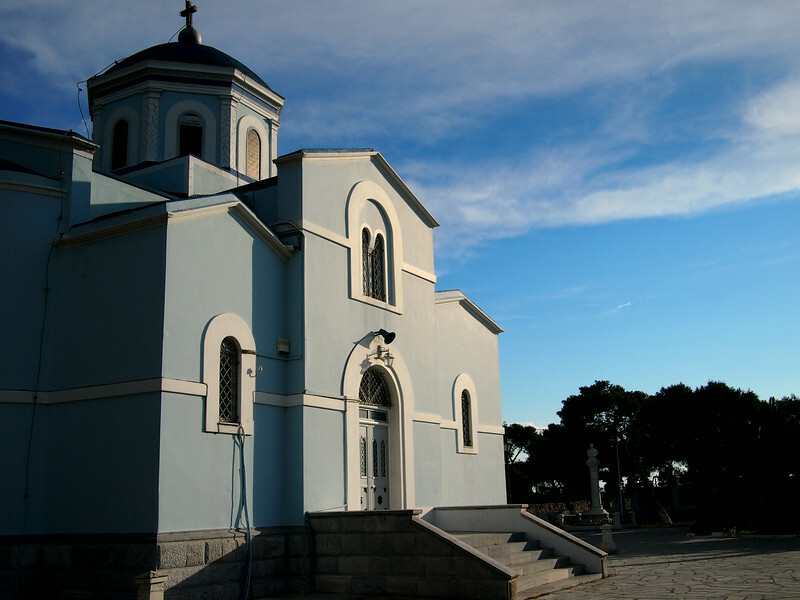 Anastasi church, completed in 1909. 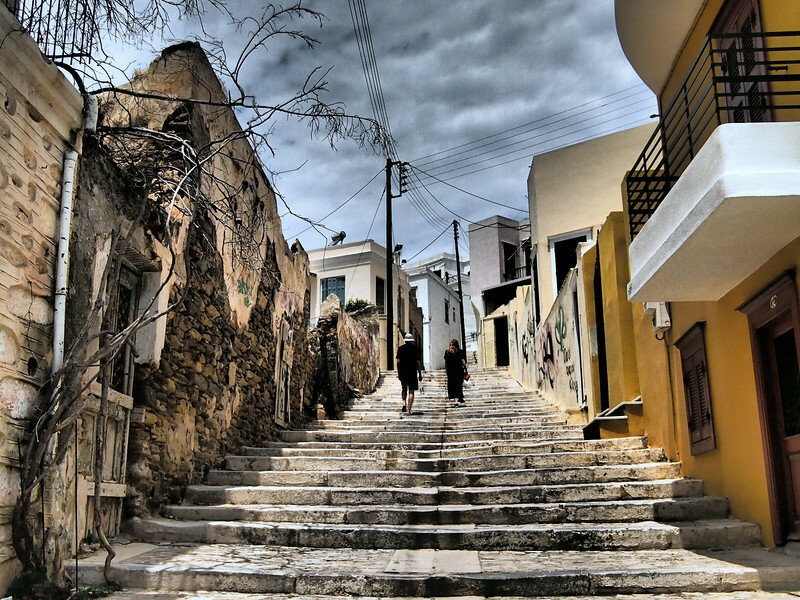 Walking up the many stairs in Ermoupoli. Graffiti on an abandoned building. 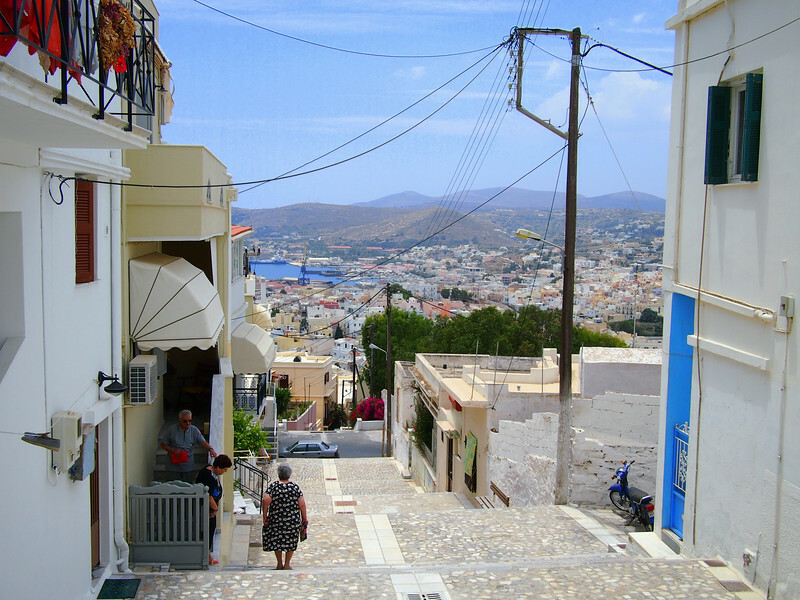 Throughout the old town, stairs led up to Ano Syros and other churches, with zigzagging tiny roads allowing for cars to do the same. Yellow walls and stone pathways. 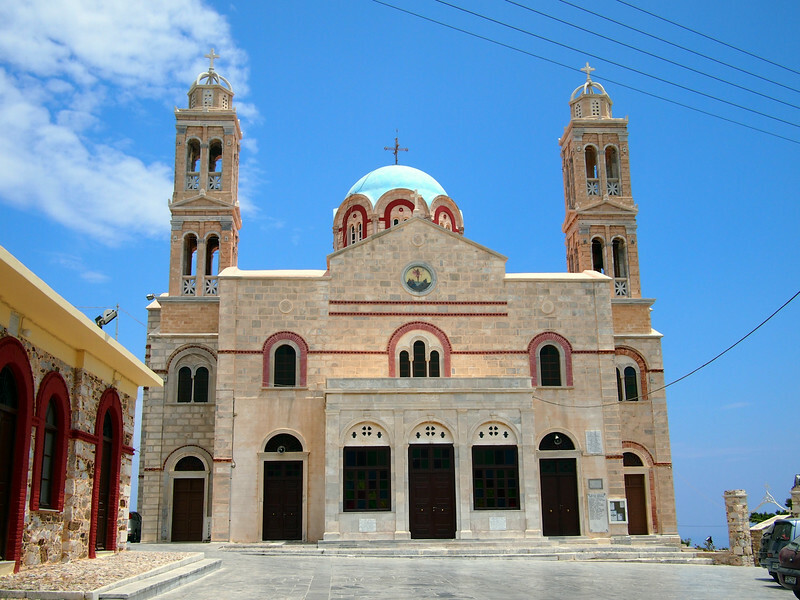 Church of Agios Nikolaos near the port. Edge of the water from the Miaouli park, looking down. While we did take the occasional field trip such as the one that resulted in the Ermoupoli photos above, for the most part our days on Syros were centred around work. Each of us had big projects that were consuming us. In my case, it was the redesign of this website. My days began with coffee, then email correspondence and back-and-forth on the redesign with the programmer I had hired, then writing, followed by a late afternoon walk and hopefully a swim. Given our work focus, most lunches were haphazard, an intrepid mixture of cooking skills from prior student days and treats from the local bakeries, open only until 1pm. For celiacs like me, bird food bars that pressed together seeds and dried fruit and chocolate, bound with honey. For the rest of the house, chocolate breads and puffy pastries filled with spinach and feta. It was eggplant and tomato and zucchini season during our visit, and we quickly discovered a tiny farm not far from our house. Our lunches incorporated grilled eggplant, spinach and tomato. We would pull ourselves away from our laptops and notebooks for dinner, a time for us to explore local restaurants where, like the bar owner, they were baffled and then pleased with our constant reappearance. One small taverna used to bring us piles of yoghurt topped with cherry compote for dessert at no charge. Seriously disappointed that I could not eat his fried local San Michali cheese, he would cut off an untouched piece for me and serve it on the side of the fried appetizer with a wink. At another tiny restaurant, pies were their specialty. The island was covered in fennel plants and thyme, and my housemates raved about marathopita, a slender pie stuffed with fennel. Meat pies or feta pies were also always available, sitting behind the cash register to tempt you on your way out. Of course, there were small culture clashes. I had to explain to this small town that I was not a picky eater, but rather had a weird disease that made much of their food indigestible for me. 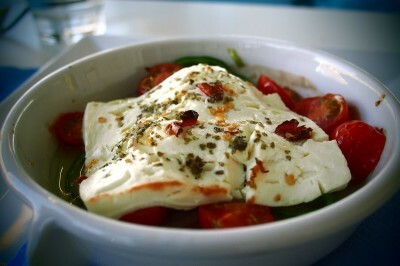 The marina restaurant where we found spicy baked feta gave me lettuce instead of bread, albeit suspiciously. Maintanosalata, another Syros specialty, became our go-to appetizer as a nearby restaurant agreed to make it without breadcrumbs, letting the parsley, lemon, onions and capers blend to perfection. I would bring my own rice cakes to soak up the juice. On my first day in town I found a gyro takeaway place, where I explained that I wanted a half portion of meat and no bread. They gracefully halved their price and provided me with a portion of fries, shaved meat, and tomatoes bigger than my head. 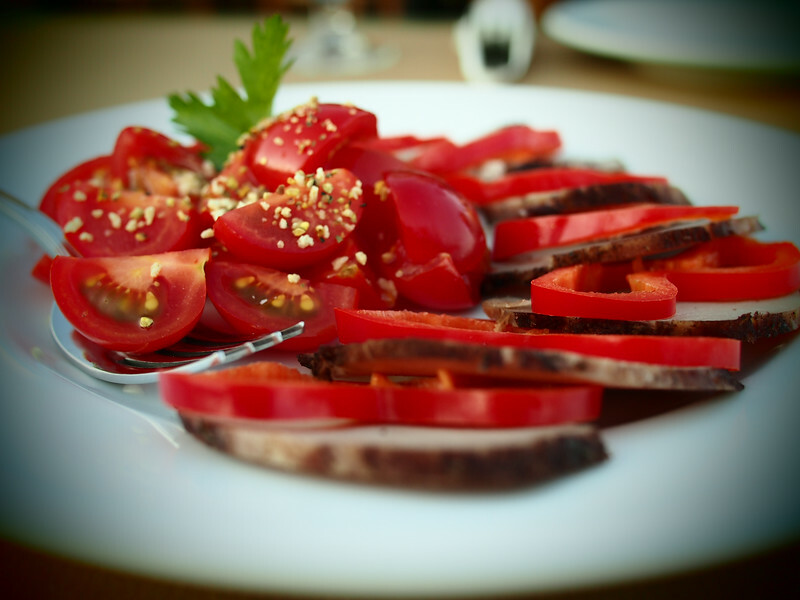 Though the Greek diet is often lauded as a healthy one, much of what we ate came with fries, with meat taking precedence over seafood on most menus. In addition, the local bakeries sold miniature ice cream bars by weight, teeny pistachio or vanilla or caramel bars coated in chocolate and on a half-stick. At 40 Euro cents for two, they were a huge weakness. Our walks became longer to compensate for all this rich food. 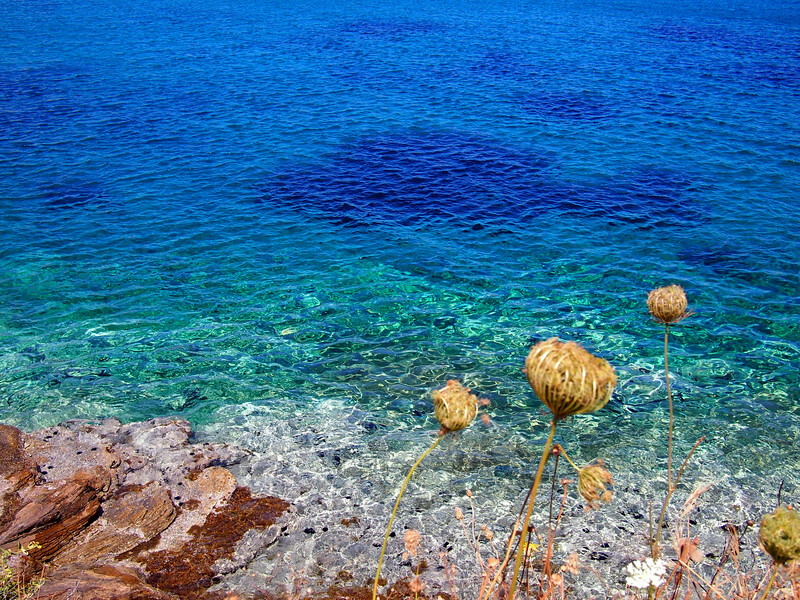 Ekklisia Agios Ioannis, near Finikas. 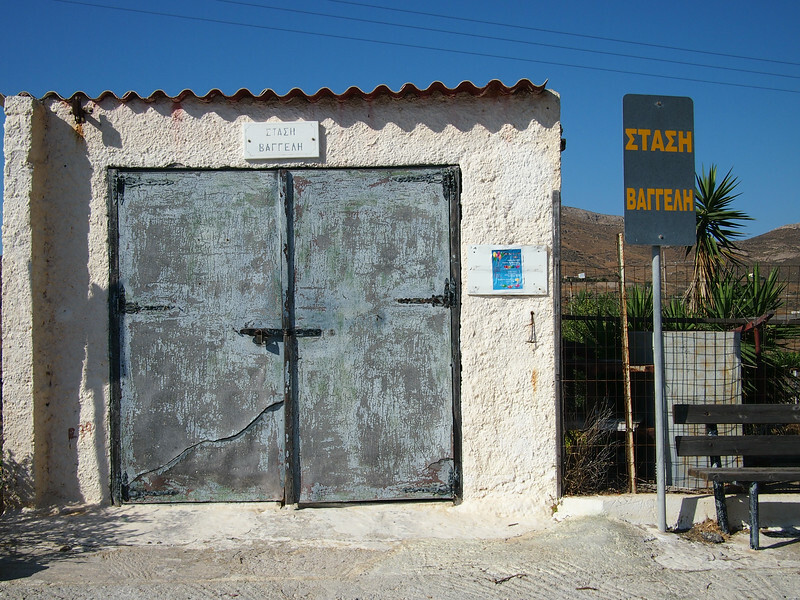 Along the road to Finikas. How could you NOT swim in this water?! 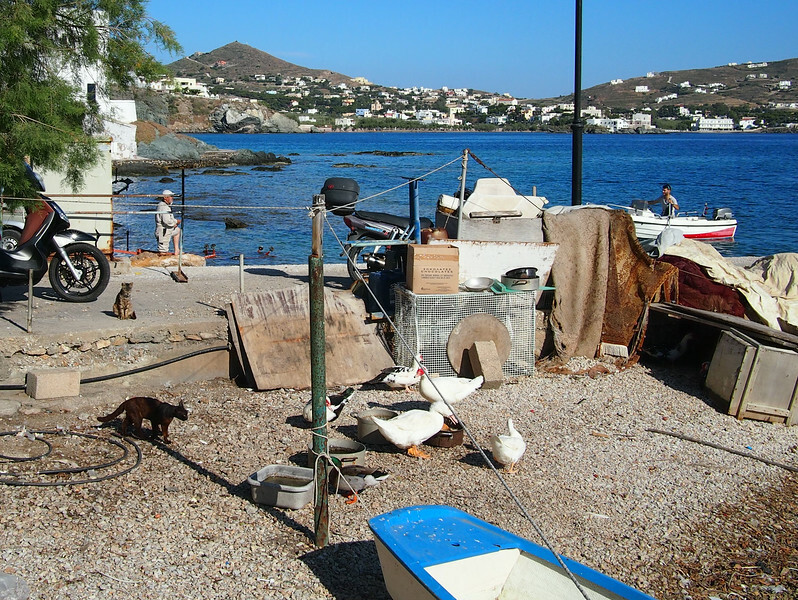 Near the Finikas marina: ducks, cats, and an assortment of furniture. Finikas marina in the late afternoon. Had to include this photo of a duck about to dive off a piece of wood. SINCE WHEN DO DUCKS DIVE? 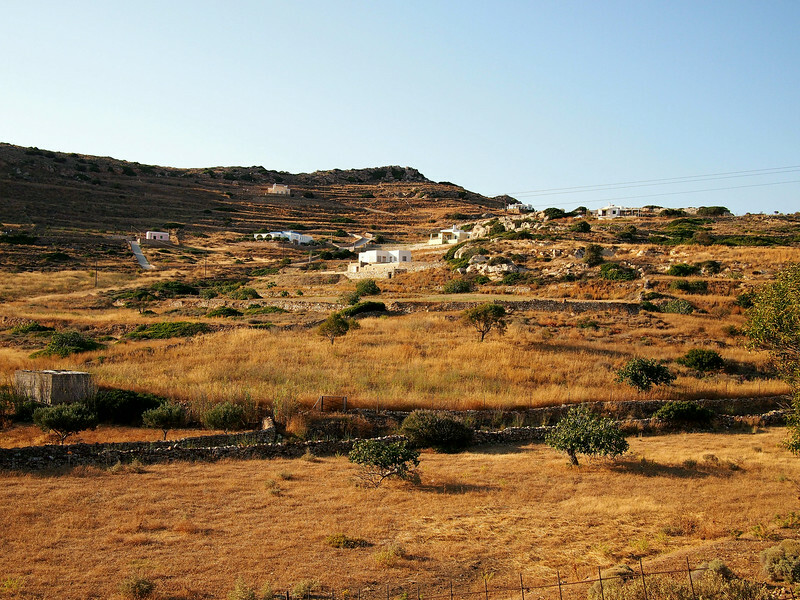 Some days we wandered the other direction in the late afternoon, away from Finikas and through the drier part of the island, ochre and honey coloured grass broken up by tufts of thyme. Below us were sea and houses and roads, but we would snake our way on the narrower one lane streets, up and down, up and down, until we got through the parched and rocky hills and down to water once again. On that side of the island and upon the recommendation of friends, we found a tiny sandy beach called Ambela. 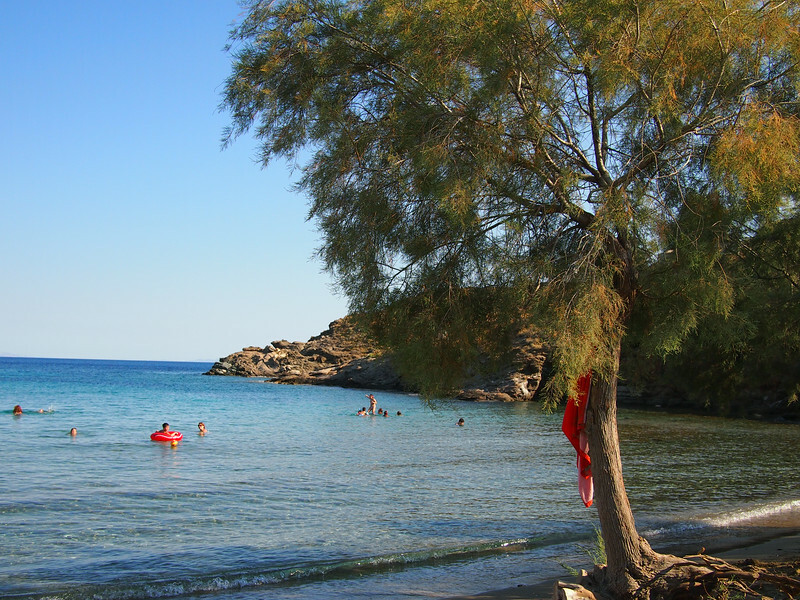 Close to the bigger beach of Megas Gialos, it was small and secluded, with a lovely restaurant called Ambela Tavern at the water’s edge. With outdoor tables and cats (and a spider that bit me several times on my first visit, leading our waiter to call me “spiderwoman” for the rest of my time there), it became a favourite spot for a late afternoon swim and sunset dinner. On the walk to Ambela beach. 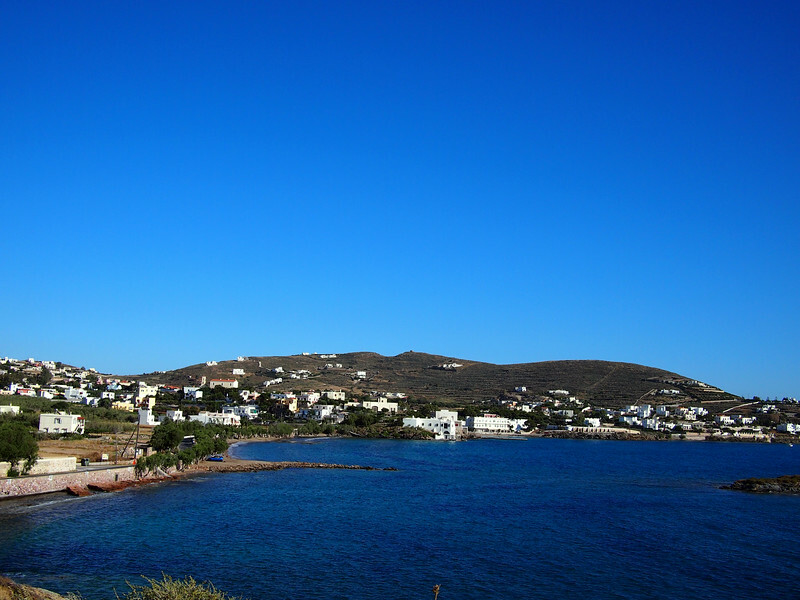 Megas Gialos ahead, the larger beach on this side of Syros. Apaki at Ambela tavern, a Cretan smoked pork dish where the pork is sliced in strips and then marinated in vinegar and spices for days, then seasoned further and smoked under a slow heat. Midway through my third week, I realized that I had a problem. I had a data plan on my phone, but writing on this site is quite data heavy, what with uploading photos to a gallery, then editing them into posts and writing captions — let alone the many drafts saved as I wrote. By having limited access to the internet I realize that I write not with words first, but by staring at photos and then turning to words. I’m a primarily visual creature, and while I write notes copiously and continuously as I travel, I need access to photos to really dig into my writing. WiFi and delicious home cooked food. How could I say no? 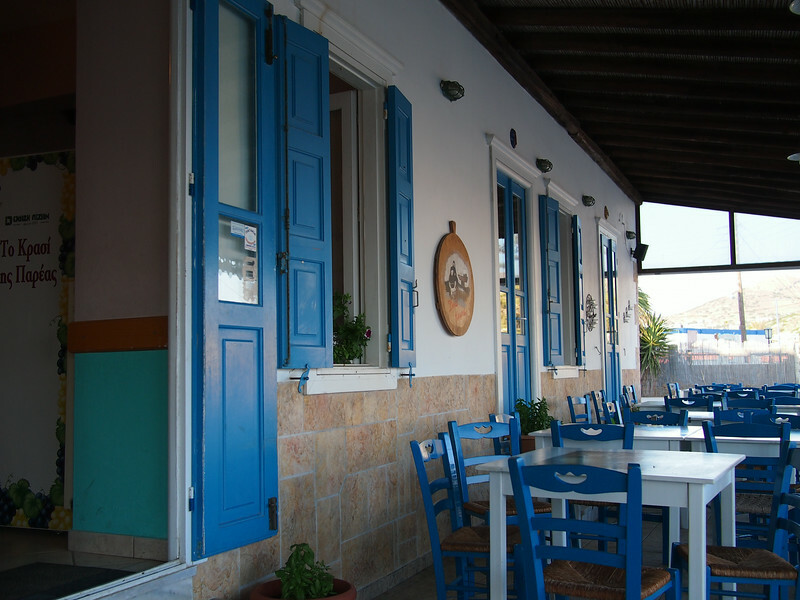 The second afternoon in my “office” I walked up to the restaurant and Sotiris was nowhere to be found. Instead, his four kids were sitting at one of the outside tables, eyeing me sideways as I unpacked my bag and laptop. They were eating pork chops, freshly grilled and served with a simple Greek salad. The oldest, Michael, served the meal to the rest of his siblings, making sure they had enough. Below the table, two life-weary cats anxiously await leftovers. Once they were done, the youngest came over to see what I was up to. By the time my friends met me at the end of their afternoon walk, she and I were sitting together, each in our own heads with our respective writing. I not only ate well but felt loved temporarily by this family of six, who were curious and cheerful and talked about their lives in Greece. Several days of newfound office time ended with all of us sitting at the table and eating grilled meat and salad, watching the sun set into the water. New friends at Dia Xeiros. My “office” at Dia Xeiros. Note: Sadly Dia Xeiros has permanently closed. 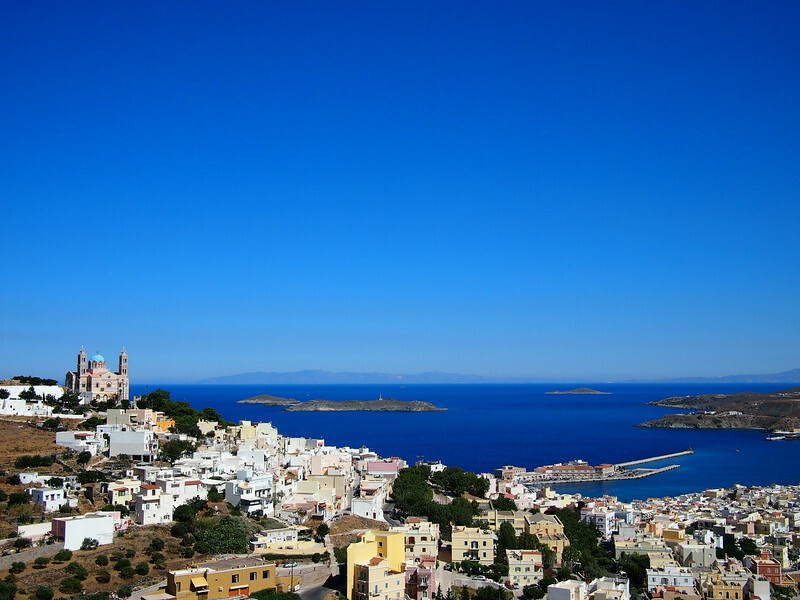 Toward the end of our month on the island, we rented a car and explored the oldest part of Ermoupoli, a medieval city called Ano Syros. Set away from the harbour and on a hill above the old town, it looked nothing like the rest of the island. 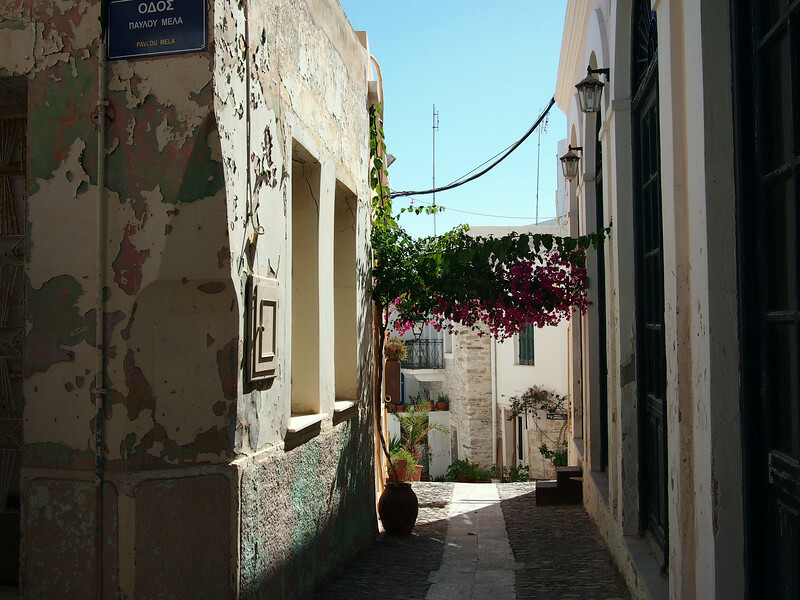 Instead of low-rise houses with verandas, Ano Syros was a mass of teeny winding lanes and steps that connected them, 13th century styles melded with the typical buildings of the Cyclades. Built in the 13th century, houses were set atop one another, clustered protectively around the Cathedral of St. George and serving as hiding places for intruders. While there are tiny tavernas and shops and museums within Ano Syros, we wanted to climb to this old city to get a better view of the island below, capping off a month in a strange Greek alternate universe, one that was so incredibly different from my previous time in Saigon. Inside Ano Syros in Ermoupoli. 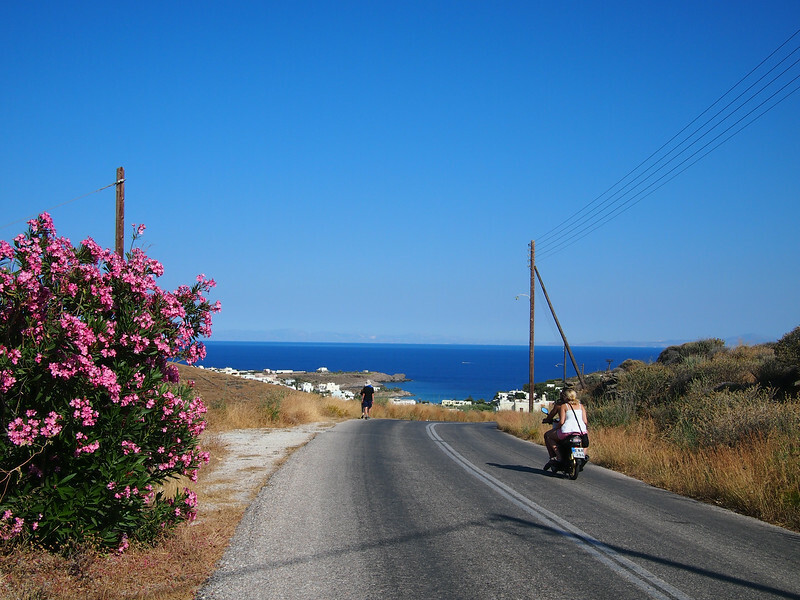 The outer ring on the drive from Ano Syros back to Finikas. I’ve mentioned previously that I was not a water baby. I grew up in Montreal and while I did join swim team and learn how to swim as a young kid, family vacations were centred around cities and sights, or skiing in the winter. The whole “family goes to the beach and enjoys the sun and sand” trip was never in my lexicon, and as an adult I was drawn to towering volcanos and cascading pine trees before any sort of beach trip. 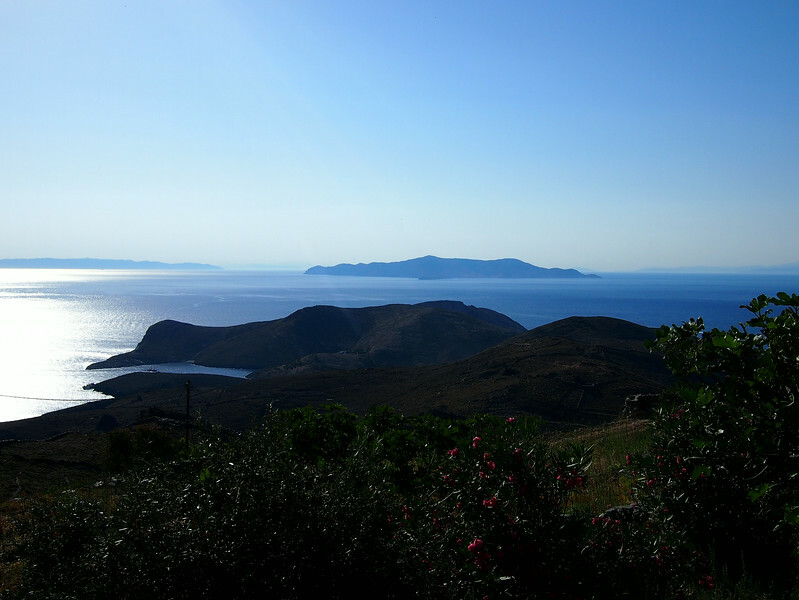 I remember looking down during the ferry trip from Athens to Syros and thinking “I know why they call it Aegean blue”. The sea was a colour that I had only seen on Pantone strips, and the sky was blindingly bright. 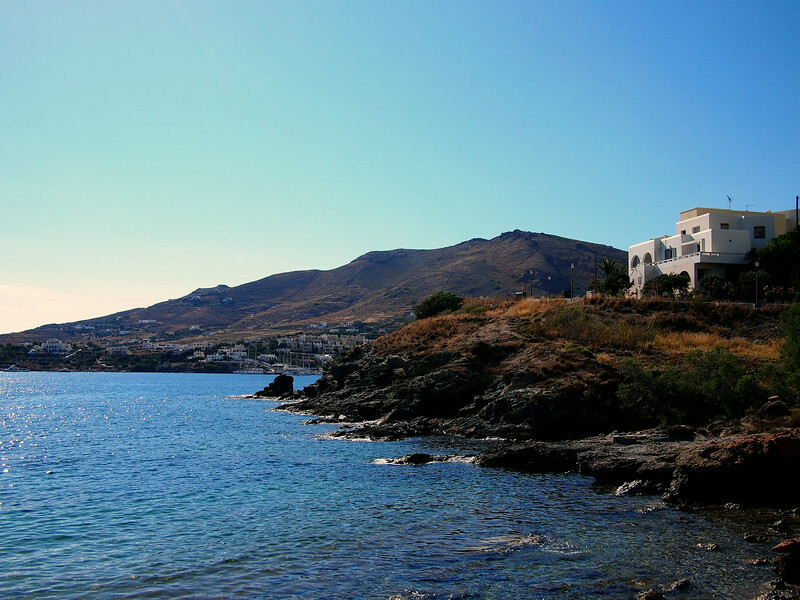 During this month on Syros I began to understand why many of my friends who grew up near the water found it sad that I felt so indifferent to its presence. The nightly ritual of wanders (and wonders) by the sea, the inky blue sky as the sun disappeared, and the ability to just dip in for a refreshing swim and then head back to work — all of these were revelatory to me, and they were lovely. I’m in New Zealand now, another country awash in blue. 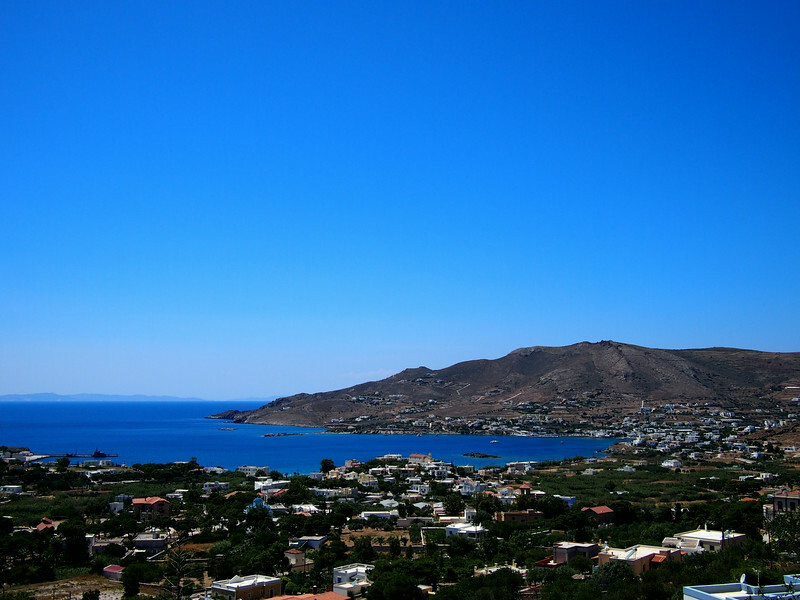 It seems fitting that I saved my Syros writeup for more blue-filled days. Since my last post, I’ve been exploring New Zealand’s North Island, including a visit to Hobbiton (!!!!) and catch up time with friends from the US who have moved here. I’ll be in New Zealand until late March, and then heading to Portugal to present a keynote at the World Food Tourism Summit. For full 2015 travel plans, see this post. As people generally ask about how photos were taken for these long posts: all of the photos except the first goat one were taken with my camera, an Olympus E-P3 camera with an excellent 20mm “pancake” Panasonic f/1.7 lens. I don’t edit my photos other than to straighten or crop in Picasa. I don’t use Photoshop or Lightroom, mostly because I’m too lazy and would rather focus on words. 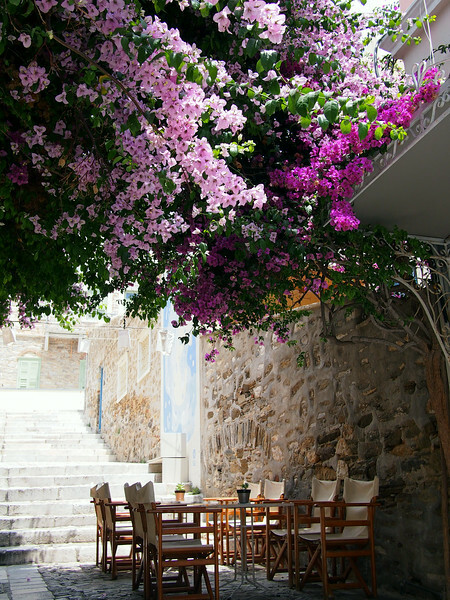 Some suggestions for where to eat on Syros below. I hope everyone is having a great 2015 so far. Perfect place for a bite to eat. Tell them Jodi from Canada sent you! email: [email protected] and Facebook page here. 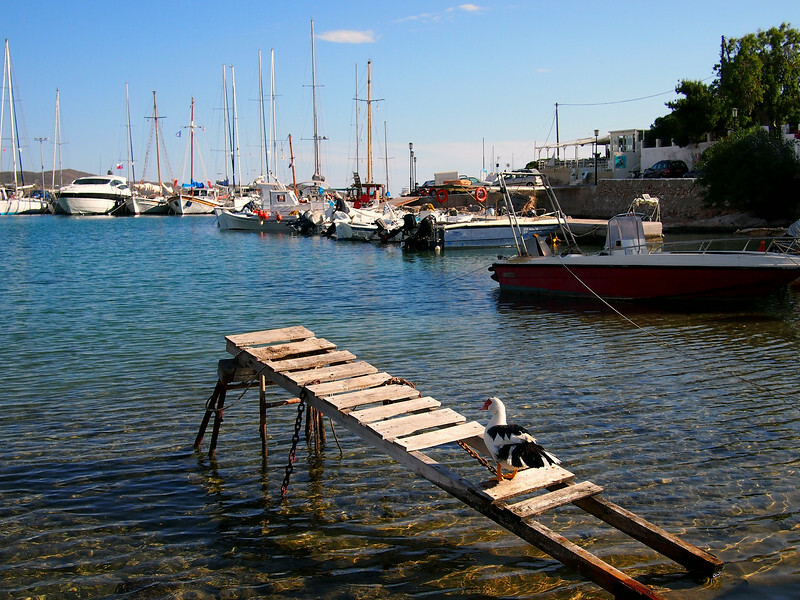 Agathopes: a small restaurant called Meltemi Taverna, just along the water near the Agathopes pier. Try their eggplant stuffed with lamb and tomatoes. San Michalis: To Plakostroto Taverna, San Michalis. A great writeup here. Thanks for the wonderful photos. They brought back many fond memories of long ago. 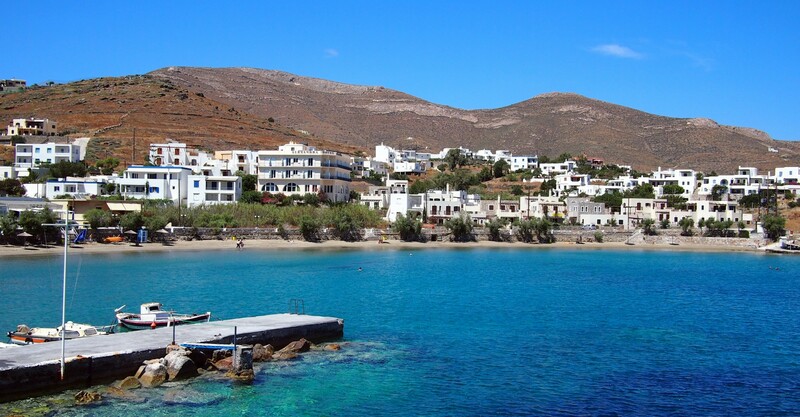 I lived in Greece from 1970 until 1973, when Mykonos and Ios were totally underdeveloped and quite inexpensive. Santorini ( or Thira as the Greeks called it) was unvisited by the bulk of tourists. 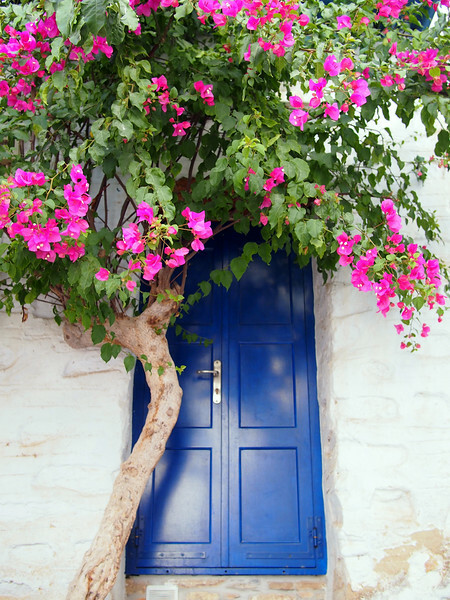 I was on Syros and many other islands for a month in August of “72- I remember the magnificent blues and turquoises of the sea (thalassa), the open hearts and warmth of the Greek islanders, and of course the food. Breakfast on Ios consisted of a bowl of Greek yogurt filled with watermelon (peponi ), apricots, grapes, melons, and of course a huge dollop of the famous Greek honey. These fond memories are with me forever, and thanks to you, brought to mind in full. Efcharisto poli! Ya sas! Thank you for sharing your great memories, Franco! 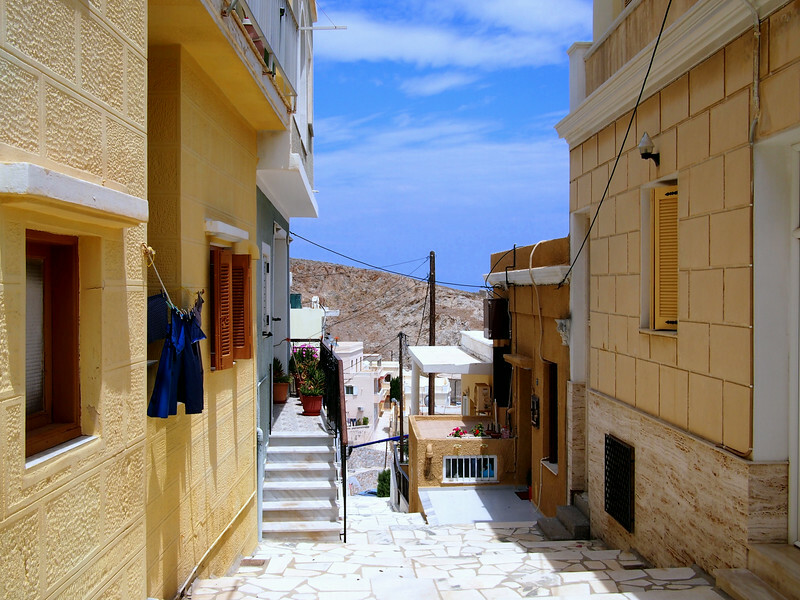 I would loved to have seen Syros so many years ago. Happy that my post brought you back! Awesome is the word I can think of when I read. I can’t find enough words to express my admiration for you. Pics are simply to die for. I am enjoying what you wrote while hanging at my Theo’s place overlooking Finikas, having eaten last night at Meltemi (incredible tzatziki and salads too) and swimming in the bay. 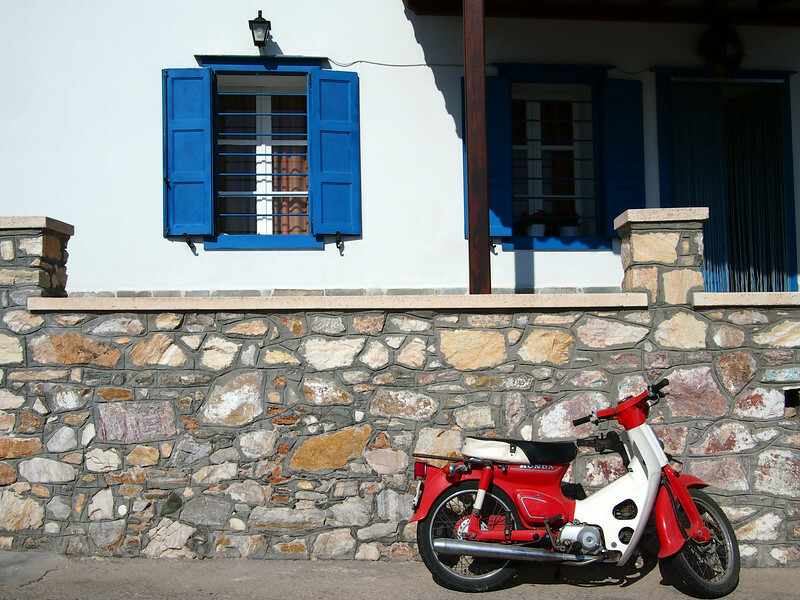 I’m tempted to visit Santorini or Antiparos where there are more relatives to meet, but the cool groove in Syros may be too good to leave. Yay! Glad you’re enjoying Syros, and please do send me a note if you have any additions or changes to this post. Just came across your site. Seems I saved it from awhile ago. And guess where I am? Begins with an S and ends in yros. Liking it. Very different from the other islands. Good writing and beautiful photos. Lovely! I hope you enjoy your time on the island. Sadly I think my favourite “office” restaurant has closed but please do let me know if that’s the case. It would be a shame as they were such a lovely family. Safe travels! Honestly this post blew my mind! Congratulations on the photos! 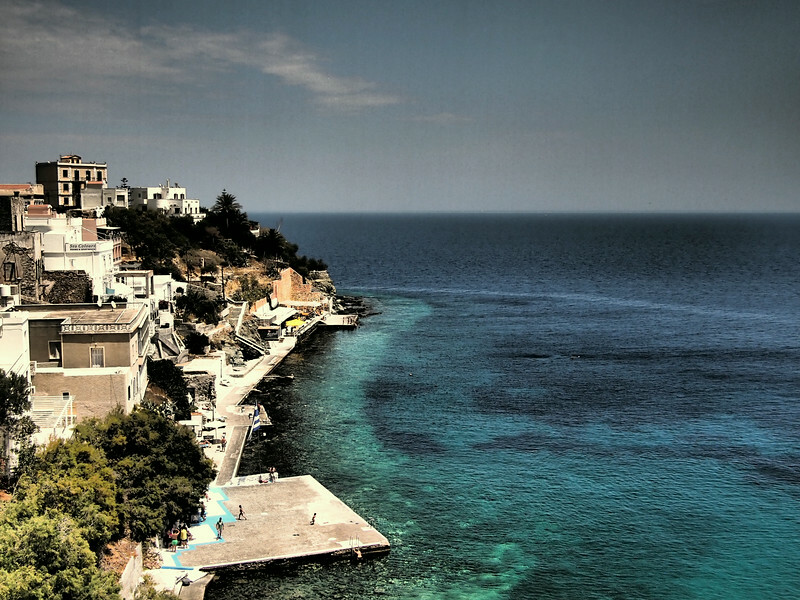 I’ve never been in Syros, although I’ve visited Greece 3 times. It’s definitely in my wish-to-go list now! When I was in Greece, two years ago, we decided to go somewhere different from the mass tourism destinations. So we visited Kythera. Best decision of my life! So much beauty in one place, you wouldn’t believe! I totally recommend spending a week there!